Intellidance Blog Voted #1 Education Blog in Canada for 2013! I'll admit at first I had no idea what Stephanie (who happens to be a client at my studio J’Adore Dance) was referring to. I had won something related to my blog?!? Upon further investigation I learned the Intellidance Blog had been voted the #1 Education Blog for the 2013 Canadian Weblog Awards! As an educator who has always struggled with writing, yet desired to share my interests, experiences, and expertise, this was a huge honor! So what are the Canadian Weblog Awards? The Canadian Weblog Awards promote good weblogs of all genres from across Canada year round through regular interviews, articles, and the nomination, judging, and an award process that culminates with the announcement of the top three weblogs in each category on December 1st. 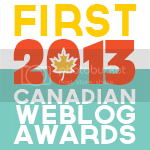 The Canadian Weblog Awards are about quality not popularity, so there is no public vote. Each weblog is judged by a volunteer jury against a set of criteria. Why do Canadian bloggers need these awards? Even the best weblogs can get buried under the swathes of information that flood the internet, and the Canadian Weblog Awards are determined to bring good Canadian weblogs to light. This is why we use a panel of judges rather than the popular vote to unearth our best and brightest. The use of a judging panel that follows a specific set of criteria to evaluate the nominees helps to ensure that the winning weblogs are chosen more for their quality rather than by how many people they can mobilize to vote. I find Canadians are often afraid to sing their praises, although we a country filled with inspirational game changers. Perhaps it is that humble Canadian nature that allows us to focus on the work at hand rather than being distracted by awards and accolades. Either way I am very honored that the 2013 Jury Panel (and my anonymous nominator) felt the Intellidance blog was worthy of recognition. Thank you to our readers around the world for visiting and reading the blog! We have some big plans for the Intellidance blog and website over the next year and can't wait to share them with you!